This award-winning responsive poem focuses on the Australian ghost town Wittenoom, abandoned due to toxic dust caused by asbestos mining. 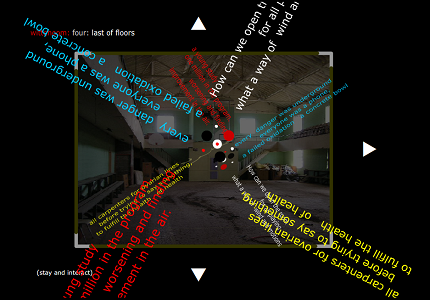 Each of its nine parts focuses on an aspect of the abandoned town and consists of an image from Wittenoom, generally portraying urban decay, an brief looping instrumental audio track, links to other parts of the poem, a title for the section, and a text accessible through different responsive interfaces. A brief parenthetical help text near the bottom left corner of each screen provides encouragement that hints at the interface, promting readers to explore the interactivity and intuit its internal logic. The thematic focus and consistent visual design pull the work together, while the varied interfaces lead to new explorations of the spaces, together producing an experience both jarring and immersive. 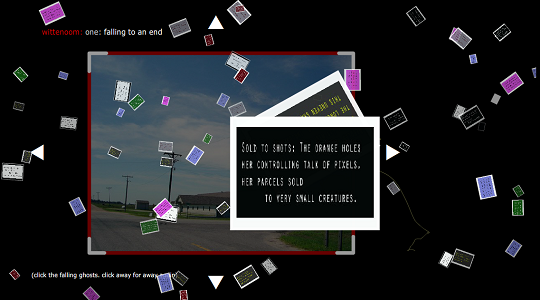 For example, the initial interface (pictured above) is invitingly simple: readers just need to select the falling “photographs” to bring them to a readable foreground. The photos (little screens, actually) are color coded to allow readers to remember which ones they read and therefore read all of them, minimizing repetition. Other interfaces are more complex and require practice getting some control over them, such as the one pictured below, which has a three-dimensional cube-like cluster slowly moving and rotating in the screen as it follows the pointer. A pattern in the poem’s distinctive nodes is the reader’s progression from disorientation to clarity, from digital environments tracking a reader to readers understanding their rules taking control over the same. And yet, stabilizing the display of text for readability reveals the oldest encryption algorithm of all: poetry itself. The parallels between the overall poem’s strategies and Wittenooms’ corporate, labor, medical, and political history are worth exploring, especially considering the bigger picture of human beings and their environment.